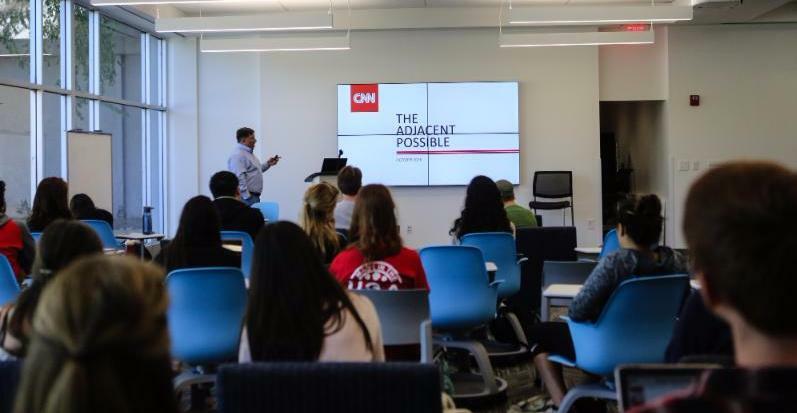 This month, the NMI had the pleasure of hosting Greg Agvent, the director of CNN’s new Aerial Imagery and Reporting unit, to explore future partnerships between CNN AIR, the NMI and Grady College. If you haven’t heard of CNN AIR yet, their purpose is simple: enhance CNN’s news reporting with drone footage. When CNN AIR launched in August, we knew we had to connect. Just a few weeks later, Agvent joined us here in Athens. Throughout the day, he met with our NMI team, the Dean and other Grady faculty to talk all things drones. His visit wrapped with a talk on the possible use of drones as a journalistic tool, as well as some of the ethical barriers we may face. NMI students filled the seats and were thrilled to see yet another example of an industry using emerging technology to take a good product and make it better.